1. The Occupy Wall Street movement came to Oakland yesterday afternoon, drawing about five hundred people to downtown, the Trib and Chron report. Protesters, who are demonstrating against extreme income inequality that is worsening throughout the country, also held a small protest in downtown Berkeley. Occupy SF also held a small protest in the city. 2. On October 17, Oakland voters will begin voting by mail on Measure I, a parcel tax that would generate about $11 million a year in revenues for the cash-strapped city, the Trib reports. 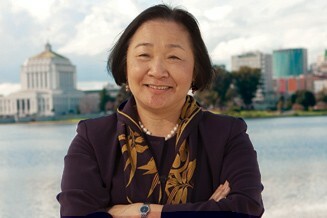 Under a proposal by Mayor Jean Quan, about $5.4 million would go to police, while the rest would be used for pothole repair, parks, libraries, violence prevention, technology, and street lighting. 3. The state decision to ban hybrids with solo drivers from carpool lanes has turned out to be a big mistake, the Chron reports, citing a new UC Berkeley study. On July 1, the state forced hybrids back into regular lanes, slowing down traffic in those lanes as well as in the carpool lanes. The reason? Backed up traffic in the regular lanes is prompting carpoolers to slow down, too. 4. Governor Jerry Brown charted a moderate course as he finished signing and vetoing bills over the weekend. The Chron reports that Brown pleased progressives when he signed a new anti-bullying law for students. But the CoCo Times reports that the governor also angered liberals when he vetoed a bill that would have allowed the UC system to use race as a factor in admissions. 5. Opponents of a new law that requires California schools to teach about the contributions of gay, lesbian, bisexual, transgender, and disabled people are struggling to meet a deadline to put a measure on the statewide ballot that would overturn the law, the Chron reports. However, the group still has time to make the November 2012 ballot. 6. Netflix has jettisoned its controversial plan to spin off its rent-by-mail DVD service as Qwikster, the Chron reports. However, critics immediately jumped on the Silicon Valley company for its seemingly rudderless leadership. 7. And a Napa pumpkin, weighing 1,704 pounds, broke the record for the heaviest gourd ever grown in California, the Chron reports.